PA President Mahmoud Abbas is so anxious to take over all of Jerusalem that he has created a Facebook page showing the PA flag superimposed over the picture of the Western Wall! All this as peace talks have just commenced. Wanting something belonging to another is called "coveting," and is the 10th of the 10 Commandments not to do. "Thou shalt not want anything of your neighbor's; his wife or anything else belonging to him." 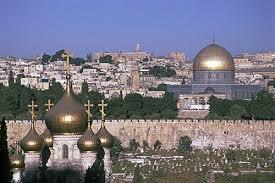 Jerusalem is a Jewish city proven by its history. It was created by King David as the capital of his empire, and remained the capital from 1000 BCE to 586 BCE and again was the capital from 516 BCE to 70 CE when Rome burned it and took Judah. Though others came and ruled, it was never their capital. "Only for Jews has it been the capital of the nation living in this Land." Jordan had illicitly taken Judah and Samaria in 1948 CE but by coveting more land and attacking Israel in 1967, a war which the Arabs lost, the land reverted back to its proper owners, Israel. It had been part of the package approved by the League of Nations in 1922 to be the Jewish Homeland. Isn't it amazing how G-d moves in mysterious ways? The Arabs coveted all of Israel but lost land instead. It should have been a lesson to the world but this part of the 10 Commandments is ignored by all, except Israel, of course. In 1967 after winning, Israel was able to unite the coveted Eastern section of Jerusalem with the rest of the "City of David," Jerusalem's other name. The Jews living here are people with the longest unbroken historical association with this special city, dating back 3,000 years. Only to Jews has Jerusalem always been the focus of national and religious aspirations. Since 1948 it has been the seat of the President of the State, the Knesset, the Government, the Supreme Court, the Chief Rabbinate, the Hebrew University and the Israel Museum. It's a sorry fact that the United States has not understood this and hasn't recognized it as Israel's capital. They maintain their affairs in Tel Aviv. They're afraid of angering the Arabs. The holiest shrine for Jews is the Western Wall in Jerusalem, the one Abbas has superimposed his flag over now that he has thrilled everyone by sitting down at the peace table. This wall dates back to the time of the 2nd Temple. When the war of 1967, which was won in 6 days was concluded, Moshe Dayan arranged that the Muslims would still control the mosque of Al Aqsa on the Temple Mount in Jerusalem which is their holy shrine in Jerusalem. The Muslims administer the area and do not allow Jews near it. They cannot even pray at a distance. The mosque is built over the Temple's site and this is why observant Jews want to pray, but can't there. We only had the one temple, built by King David's son, King Solomon. It was he who was known as a peaceful king, standing for peace and wisdom. It had been rebuilt in the same site. That was our most precious remainder of our religion, and now, because of Moshe Dayan's generosity and good heartedness, find that they are only left with the Western Wall. Our Tanakh (Old Testament) is full of references about Jerusalem. Zechariah, 8,3 said, "Jerusalem shall be called "the city of truth." So let the truth come out about Jerusalem's city and why is must remain as a whole city under the auspices of Israel. Notice in the picture above that all 3 religions are viewed; the wall, Christian churches and the Mosque. All have been honored by Israel. There is no reason to tear apart this holy city. Psalms 122:6 said, "Pray for the peace of Jerusalem; those who love you will be serene. May there be peace within your wall, serenity within your palaces. For the sake of my brethren and my comrades, I shall speak of peace in your midst. For the sake of the House of "Hashem (G-d), our G-d, I will request good for you." "The built-up Jerusalem is like a city that is united together." "Jerusalem, which is bound firmly together." It has been united under one mayor. Jerusalem by name, as it is in the Tanakh 622 times, is not found in the Koran even once. What's good for Jerusalem is that it remain a Jewish city, it's capital, as a whole city, not a divided one as before 1967. Nir Barkat, Israel's present mayor, said in an interview about the peace talks on Friday, " “If the deal collapses because it hinges on the Jerusalem issue, so be it. It is better not to make any deal than to agree to a bad deal,” Barkat told Israel Hayom . Nir is fully aware of the condition Eastern Jerusalem was found in at the end of the 67 war when Jews could not enter for 19 years. The word is "tragic." Jerusalem was divided in two-between Israel and Jordan. Barbed wire and concrete walls separated the two parts of the city. Jordanians didn't allow any movement of people from one part to another of the city. Today it is a thriving city of coexistence between Jews and Arabs, between people of all faiths, and between the religious and the secular ways of living. Since 1973 there had been a serious housing shortage so a large building program was carried out in all parts of the city, both Arab and Jewish. The Municipality has been planning the future of the city so that a balance between ancient and modern is maintained. In order to appease the Arabs, Netanyahu went for 10 months without building a thing, and since the result was nothing, has decided not to ever do that again, which of course angers the Arabs who want to maintain that nothingness on the part of the Jews. Yesterday, Israel approved building about 1,200 more homes, but in order to do it, had to agree to freeing 26 Arab killers out of prison in a few days. The total number of criminals is about 104 and will be released in 4 stages. Israel's Housing Minister, Uri Ariel, has approved construction of 1,187 apartments in Judea and Samaria and East Jerusalem which almost caused the Arab contingent to walk away. They claim they do not understand why Israel is doing this and of course will complain to Kerry and the EU. Martin Indyk of the USA group met with Abbas on Sunday in Ramallah. After all, the Palestinian Arabs had their sites on much of the Jews' land for themselves. Israel has had to put up with wars with the Arabs since 1947 and attacks of mortars, missile and rockets that rain down even to this day on southern Israel from Gaza. The Arabs were offered many times the opportunity to have their own state and instead chose trying to take it all away from the Jews. Now it is the Arabs that are impatient? It's only because Israel is building after being stopped for reasons that didn't pan out so many times. What Israel has given up in land, such as Gaza, is viewed as a huge error on their part. They did it in the promise of peace only to find that it was a piece of their land that the Arabs wanted, like the whole piece. The Arabs think that Israel has just put up a smokescreen, but what have they been doing? Trust is something that is earned, and it is not at this table. Certainly not with Abbas putting up the flag of Palestine over the Western wall, even on Facebook.